The eradication of the North American beaver in Tierra del Fuego is being attempted by the governments of Chile and Argentina in this area at the southernmost tip of South America. The non-native species was introduced in 1946 as a potential source of commercial fur trading. When the fur trade industry was unsuccessful, however, the beavers became problematic and the governments agreed to intervene. A June 2011 NPR report stated that the beavers have caused millions of dollars in damages. According to Nature, this plan is the largest eradication project ever attempted. The North American beavers have no natural predators in the area. In their native habitats such as Canada, bears and wolves prey on the beavers and keep the population under control. One observer noted that anyone considering importing beavers should also import bears, those being beavers' natural predators. According to a June 2011 NPR report, 200,000 beavers are living in the area. Another report puts the number in excess of 100,000, and states the level of destruction as akin to having bulldozers thrashing through the area. 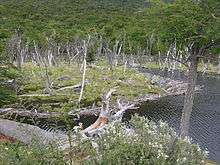 Tierra del Fuego National Park in Argentina is especially threatened, as the beavers are destroying long-protected trees. The animals have spread beyond Tierra del Fuego itself into the Brunswick Peninsula of Chile, and the government fears further penetration into continental South America. The beavers already threaten around sixteen million hectares of indigenous forest. Unlike many trees in North America, trees in South America often do not regenerate when coppiced, destroying the forest. As well as felling trees, beavers create dams that flood certain areas and thus drown other trees and vegetation. Flooding from beaver dams also damages roads and cattle-grazing pastures. Ecologist Christopher Anderson, professor at the Universidad de Magallanes, has said, "The change in the forested portion of this biome is the largest landscape-level alteration in the Holocene — that is, approximately 10,000 years". Some park rangers use steel traps that snap down on the animal's head and instantly kill it. Private individuals receive rewards for trapping beavers, although success has been elusive. Government officials plan to bring in professional trappers who have specialized dogs and use helicopters and boats to move in rolling fronts. The efforts have been subjected to scientific study. Currently, the emphasis in the Tierra del Fuego National Park is on control, not on eradication. Top Gear's "The Patagonia Special" mentioned the issue with the hosts talking about eating beaver. ↑ "American Beaver Eradication in the Southern tip of South America: main challenges of an ambitious project". Aliens: The Invasive Species Bulletin. Invasive Species Specialist Group of IUCN (29): 9. 2010. ISSN 1173-5988. 1 2 Gotkine, Elliott (2 May 2005). "Argentina's great beaver plague". Tierra del Fuego, Argentina: BBC News. Archived from the original on 12 September 2012. Retrieved 25 April 2013. 1 2 3 4 5 6 Forero, Juan (24 June 2011). "Imported Beavers Gnaw Away At Argentina's Forest". NPR. Retrieved 7 July 2011. 1 2 3 4 Choi, C. (2008). "Tierra del Fuego: The beavers must die". Nature. 453 (7198): 968. doi:10.1038/453968a. PMID 18563116. ↑ Short documentary about the beavers and the damage they cause in Tierra del Fuego Province, Chile, "Beavers in Tierra del Fuego"
↑ Mok, Kimberley (19 June 2008). "Plans to "Totally Eradicate" Tierra del Fuego's Invasive Beavers". Natural Sciences. Retrieved 24 April 2013. ↑ Campbell, Dr Ruairidh. "Philopatry and territoriality in the Eurasian beaver". Wildlife Conservation Research Unit. Archived from the original on 21 September 2013. Retrieved 25 April 2013. ↑ Parkes, J.P.; Paulson, J.; Donlan, C.J. ; Campbell, K. (March 2008). "Control of North American Beavers in Tierra del Fuego: Feasibility of Eradication and Alternative Management Options" (PDF). Comité Binacional para la Estrategia de Erradicación de Castor es de Patagonia Austral/Landcare Research New Zealand Ltd. Retrieved 26 April 2013. ↑ Forero, Juan (June 19, 2011). "Beavers devouring Argentine forests, but some cringe at eradication plan". The Washington Post. Bangor Daily News. Retrieved April 26, 2013. The beaver in Tierra del Fuego, short documentary with subtitles.